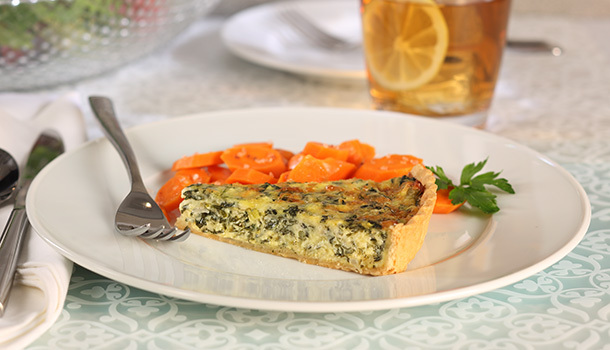 This spinach quiche recipe is infused with many Klondike Cheese® and Odyssey® Greek products. This will quickly become a family favorite for brunch or a great appetizer for entertaining. This spinach quiche recipe is infused with many Klondike Cheese® and Odyssey® Greek products. Place pie crust into a 9-inch non-stick tart pan and lightly press dough into pan. Then roll a rolling pin over the top of the pan to trim off the edges of excess dough and place pan on a rimmed sheet pan; set aside. If blind baking crust, follow the directions below. ** If not blind baking, continue with step 3. Place oven rack in the center of the oven and preheat to 375⁰F. Place chopped spinach on paper towels to thaw, or place in microwave for about 30 seconds. Then, roll the paper towels around the spinach and squeeze, until the excess liquid has been removed. Place spinach in a large mixing bowl. Add the shallot, celery, Brick and Havarti Cheeses, Greek Yogurt, Feta Cheese, eggs, mustard salt and pepper. Using a fork, stir until well combined. Pour mixture into prepared tart pan. Bake until done about 35-40 minutes. If top starts to over brown, lightly cover with foil. Let quiche rest for a few minutes before slicing. * Peel the celery rib back with a vegetable peeler; this removes the strings which makes the celery tender. ** This step is optional and is referred to as blind baking or “pre-baking;” it helps to keep the pastry crust crisp. Place oven rack in the center of the oven and preheat to 400⁰F. After placing pie dough in tart pan, line the dough with a piece of parchment paper and evenly fill with pie weights; dried beans are a good substitute. Place tart pan on a rimmed baking sheet and bake for 20 minutes. Remove from oven and carefully remove parchment and pie weights. Set aside. Reduce oven temperature to 375⁰F. Then continue with step 4 and prepare ingredients as directed.